Mortal Kombat creator NetherRealm has devised a new technology that allows it to re-balance the game dynamically without players noticing. The studio can make special moves more or less powerful and even combat infinite combos without players having to download a patch. "In Mortal Kombat we have a system where we can make adjustments to the special moves and balance things out even after the game has been released," series creator Ed Boon revealed to Eurogamer. "If an infinite were to come out, or a character is too powerful, we can make adjustments and address those things immediately." Mortal Kombat's dynamic re-balancing system contrasts that employed by Capcom with the likes of Street Fighter IV and Marvel vs. Capcom 3. Capcom re-balanced Street Fighter IV characters with the release of standalone game Super Street Fighter IV, and will do so again this summer with the launch of Super Street Fighter IV Arcade Edition – also available as a downloadable add-on. Capcom has updated Marvel vs. Capcom 3 with patches designed to fix bugs, combat infinite combos and nerf characters such as devil spawn Sentinel. While Boon refused to reveal exactly how Mortal Kombat's eye-catching re-balancing tech works, he did describe it as a "mini update". "It's something that's built into our system," he said. "We can do it without having players have to download a patch. That's something we're very excited about. We can monitor what things players may have an issue with and then correct them as needed. "That's the new technology we developed for this game. We've seen other fighting games, including our own, have characters we wish were more balanced, more powerful or weaker. So we devised a system that lets us modify the rules of the game, dynamically. "You could think of it as a mini-update, but it's done in the background." Boon said it was "impossible" to create a perfectly balanced fighting game. "Balancing a fighting game is always very challenging. I don't think there is any fighting game that was ever made where every character is equally powerful. The nature of special moves and the damage the characters have, it's physically impossible. "Even Street Fighter IV, when it first came out, the Sagat character was insanely powerful and the Guile character was very weak. When they released Super Street Fighter IV they tried to balance it out." 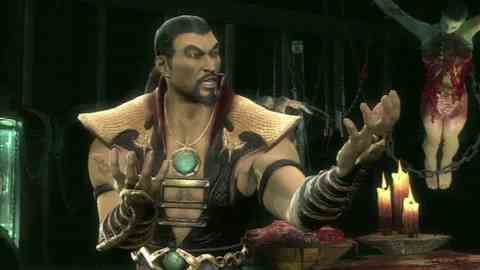 Eurogamer's Mortal Kombat review went live this morning.